When we think about our favorite destinations, and the routes we travel in order to reach them, it becomes clear how important Placemaking is in fostering walkability. Having dense, mixed-use neighborhoods is important, but it isn’t enough. To encourage walking, we also need concentrations of distinct and human-scaled places that are connected by a network of great streets. 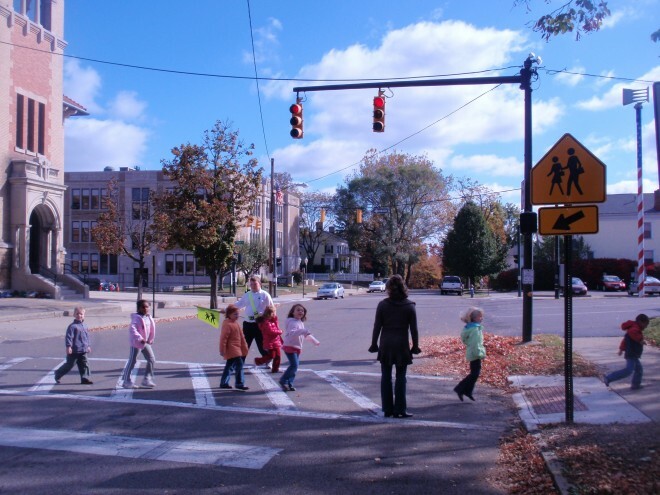 Here are some thoughts from PPS Senior Fellow, Jay Walljasper, on the Surgeon General’s landmark Call to Action, announced earlier today, which emphasizes the importance of walking and more walkable communities to America's health. We’ve always known walking is good for us--- it burns calories, reduces stress and helps the environment. Surgeon General Murthy announced a national campaign to encourage Americans to walk more and make all communities safer and easier for walking. His office will partner with schools, citizens groups and businesses to meet these goals. The landmark report---which is being compared to the Surgeon General’s 1964 warning on the dangers of smoking---is based on definitive medical evidence that moderate physical exercise boosts your health and cuts your chances of developing diabetes, dementia, depression, colon cancer, cardiovascular disease, anxiety and high blood pressure by 40 percent or more. A major study released this year shows that lack of exercise is twice as deadly as obesity, according to Cambridge University researchers who studied more than 300,000 people over 12 years. Their findings match another comprehensive study that found sitting for long periods is linked to higher death rates. This explains why the Surgeon General and a growing chorus of health care experts are singing the praises of walking. The federal Centers for Disease Control and Protection (CDC) recommends Americans walk at least 30 minutes a day five days a week---or bike, run, swim, dance, garden do aerobics and play sports. (For kids, it’s 60 minutes a day seven days a week.) Taking a walk is the exercise that people stick with most over time, according to the American Heart Association. “Walking is like medicine for my patients. If walking was a pill or surgical procedure,” it would be all over the news, says Dr. Bob Sallis , a family practitioner in Fontana, California. Walking stands out as Americans’ favorite aerobic activity because it’s free, easy, available anywhere---and, most of all---it’s fun. Six in ten Americans take a walk at least once a week, according to the Centers for Disease Control and Prevention (CDC), and the number of Americans walking has risen six percent since 2005. That adds up to 20 million more people on their feet. The U.S. Department of Transportation reports that eleven percent of the nation’s trips are now made by walking. That rises to 28 percent for all trips under one mile, including 35 percent to work, 40 percent to shopping and 46 percent to religious services. The rising tide of walkers across America brings us other benefits too. Lower health care costs. Physical inactivity costs Americans an estimated $177 billion a year for medical costs, and accounts for 16 percent of all deaths, according to the American Public Health Association. More social connections. Strong social connections improve both our physical and mental health, and walking is one of the best ways to meet neighbors and deepen ties with friends. Stronger communities. “Exercise is medicine. It’s also good for the social fabric of our communities,” says former Dr. Regina Benjamin, US Surgeon General from 2009 to 2013, explaining why she added a walking path to the grounds of her health clinic in rural Alabama. “Health does not just happen in doctors’ offices and clinics — it happens where we work, live, play and pray,” she says. “What makes people walk is what makes great places to live,” adds Harriet Tregoning, head of the Office of Community Planning at the US Department of Housing and Urban Development (HUD). “Walkability is the secret sauce that improves the performance of many other things ” in our communities. Improved school performance. Walking to school boosts “cognitive performance” in students, according to Mary Pat King, the National PTA’s Director of Programs and Projects. Dr. Richard Jackson, a pediatrician and former Environmental Health Director at the US Centers for Disease Control finds that walking to school is good for children’s learning ability, concentration, moods and creativity. A stronger economy. “Walking is a business issue. A healthy workforce means a more successful workforce,” says Karen Marlo vice-president of the National Business Group on Health, a consortium of leading companies across many fields. Indeed, communities with many walkable neighborhoods do better economically than those with just a few, according to a report from the George Washington University School of Business. Higher quality of life. Walk with a Doc, a group of more than 200 doctors in 29 states, documents 100 “Benefits of Walking”, including many medical advantages but also increased physical energy, clearer skin, improved athletic performance, reduced anger, increased self-control, longer lives and a greater sense of well-being. In light of all this evidence, it’s clear that walking is a healthy, economical, sociable, pleasurable thing to do. Yet less than half of us meet the CDC’s weekly minimum for walking or any other physical activity--30 minutes a day five days a week. Americans walk less than people in most other countries. In fact, Australians walk almost twice as many steps each day as we do, a surprise in a country that is similar to the US with high rates of car ownership and spread-out suburban development. “Everyone deserves to have a safe place to walk or wheelchair roll,” Surgeon General Murthy . “But in too many of our communities, that is not the reality. To get Americans back on their feet —to enjoy better health and other rewards— we need to make strolling and striding a natural part of daily life again. This can be accomplished by removing the personal and physical barriers that discourage us from walking for recreation, relaxation, and transportation. Most Americans support significant changes in our communities to promote this goal, according to the survey sponsored by Kaiser Permanente. Eighty percent “want to design streets to make walking safer” (even if it means driving slower); 71 percent “want better enforcement of speed limits” (even if it means driving slower), and 54 percent “want communities where destinations are within walk distance” (even if it means building homes closer together). These steps are popular because they are not some radical upheaval of our way of life, but a common-sense readjustment. Walking has always been one of the most elemental human acts, central to our lives the same as breathing, eating and sleeping. Making streets and neighborhoods more safe, convenient, comfortable and interesting for people traveling on foot (or rolling in wheelchairs) is a sensible return to traditional values. It not only enhance our health, but enriches our lives by better connecting us to people and places in our communities. Jay Walljasper is a writer, speaker and consultant on making our communities great places for everyone and author of the Great Neighborhood Book. He is the Urban Writer in Residence at Augsburg College in Minneapolis and a Senior Fellow at Project for Public Spaces. Contact him at JayWalljasper.com.